The passage for this Sunday is very long, and we have to stay with some aspects only. It is highly significant that when Jesus entered the Temple the priests were absent. Simeon and Anna are symbols of God’s faithful ones, having no official status and yet – or perhaps therefore – free enough to recognise the decisive moment of grace for their people and for all humanity. It is also significant that the Holy Family are among the poor who are excused from the more expensive sacrifices and are allowed to bring “a pair of turtle-doves or two young pigeons” (see Leviticus 5:7; 12:8). – going to church and doing our bit in the parish. at these wonderful things being said about us. because it will never be different. the deep-seated prejudices of many will be laid bare. both in schools and in parishes, are not taught to see the world with new eyes. Like everyone else they are dazzled by power and wealth and set great store by them. the light of the world and the glory of your people Israel. Today we continue to meditate in our assembly on the mystery of the incarnation, and to focus our thoughts we reflect that the Word made flesh was born into a human family, in a particular culture, and so knows all our limitations from, as it were, the inside. It is because Jesus knows us through and through that he can sympathise with us in our weakness and we can have confidence in calling on him for his mercy. 1. 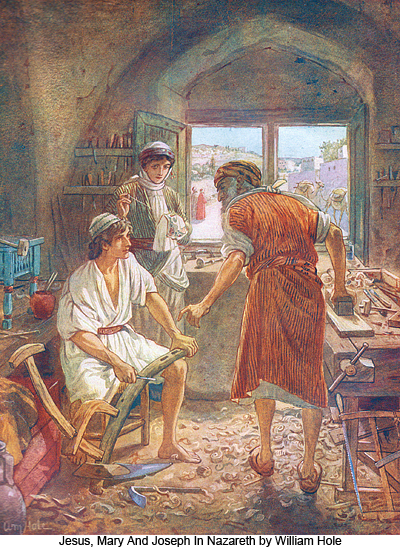 The story of the presentation in the temple is one of the events of the infancy narratives from which Luke wishes us to draw information for our understanding of the true and full identity of Jesus. 2. The task is, therefore, to go through the gospel text and draw out the series of images Luke wishes to convey, and through them build up a mosaic of the identity of the Lord. He was born within the context of the Law of Moses. He was born under the Law. He is the one whom the righteous and devout awaited. He is God’s salvation prepared in the presence of all peoples. He is a light to all nations. He is the glory of the people of God. He is set for the fall and rising of many in Israel. He is a sign that is spoken against. He is the one whom the women prophets awaited. He is the redemption of Jerusalem. He is the one filled with wisdom. He is the one on whom the favour of God rests. 4. We celebrate the mystery of God among us: we could go right through the gospels adding titles and descriptions — and yet we would still not have plumbed the depths of the identity of our saviour. Today we think of him especially as the infant in the manger, but he is also the Word through whom all things were made and without him was not anything made that was made. To follow him is life, but we will never grasp his identity for he draws us into the mystery of God. Since the gospel of Mark has no infancy narrative or reference to the early life of Jesus, the gospel for today’s feast is taken from Luke and it reports the wonderfully moving scene of Mary and Joseph bringing their newborn son to the temple to consecrate him to the Lord. In the plan of Luke’s gospel it is important because it stresses the value of the faithful piety of those Jews who waited with abiding trust in God for the coming of the redeemer. Simeon and Anna are put before us as models of patient endurance whose whole lives have been directed towards God and who have trusted in his saving will. This attitude has already been evident in the response of Mary and Joseph to all that has taken place and it will continue to characterise their lives as they return to Nazareth and watch their son grow to maturity in a world that will reject him. In the gospel for today we see Mary and Joseph presenting their newborn son to God in the temple. It was a symbolic gesture pointing to the reality of their faith. Just like all those who had gone before them in faith, this young couple were being asked to put their trust in God. It was not easy then and now in the twenty- first century with all our reliance on knowledge, certainty and contracts, it is still not easy. Going into the third millennium the Christian family needs to stand out as a sign to the world that to be truly human we must not try to play God but rather be willing put our trust in the God revealed in the holy family of Nazareth. In the gospels Jesus’ family life is hardly described. Like all of us family life would have been a big influence in his life. Because of its importance, the Church has always placed a great value on family. A new reality now is that family life now very varied: divorced and separated parents, gay parents, widowed parents; while caring for all, the church proposes the family of mother and father where possible as the ideal. We commit ourselves as a church to solutions of homelessness and poverty in families. We need to be aware of the stresses of family life, to understand them and find funding for caring for them, especially children. No matter what there are stresses in family life – the sacrament of marriage promises the help of God and the community. The church encourages family prayer, like visiting the crib with children at Christmas, and making the most of religious occasions in the family. The gospel today is about the life of Jesus growing in humanity and wisdom. 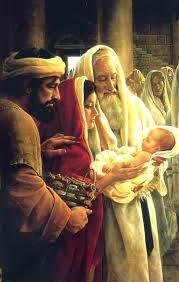 He was brought to the temple; Mary and Joseph taught him to pray. There is a special presence of God in the family: in close love God is present. In all the aspects of family life. God isn’t very fussy where He lives and moves and has his being- sometimes it’s even in a wonderfully imperfect family! In today’s Gospel, the faithful Joseph and Mary bring their son to the temple for his presentation to the Lord, a ritual required by the Law. The Book of Exodus taught that a family's first-born son “belonged” to the Lord who saved them when the first-born sons of the Egyptians were destroyed at the first Passover (Exodus 13: 15). The prophet Simeon and the prophetess Anna are idealized portraits of the faithful “remnant” of Israel awaiting the Messiah’s coming. Simeon’s canticle praises God for the universal salvation that will be realized in Jesus; in his prophecy, the shadow of the cross falls upon the Holy Family. Anna, as an elderly widow, is considered among the most vulnerable and poor of society. Her encounter with the child typifies the theme woven throughout Luke's Gospel: the exaltation of society's poorest and most humble by God. In Matthew and Luke’s stories of Jesus birth and childhood (which were later additions to those Gospels, drawn from the many stories about Jesus’ life that were part of the early Christian oral tradition that had developed), life for the family of Joseph, Mary and Jesus is difficult and cruel: they are forced from their home; they are innocent victims of the political and social tensions of their time; they endure the suspicions of their own people when Mary's pregnancy is discovered; their child is born under the most difficult and terrifying of circumstances; they experience the agony of losing their beloved child. And yet, through it all, their love and faithfulness to one another do not waver. The Holy Family is a model for our families as we confront the many tensions and crises that threaten the stability, peace and unity that are the joys of being a family. Today’s Feast of the Holy Family calls us to re-discover and celebrate our own families as harbors of forgiveness and understanding and safe places of unconditional love, welcome and acceptance. The Holy Family is a model for our families as we confront the many tensions and crises that threaten the stability, peace and unity that are the joys of being a family. The prophet Simeon proclaims that this child will be a “light” for Israel — but that light will endure great suffering and pain before finally shattering the darkness. Luke’s Gospel of the Child Jesus reminds us that the crib is overshadowed by the cross, that this holy birth is the beginning of humankind’s rebirth in the Resurrection. They have been married for 28 years. Theirs has been a happy life, filled with wanderlust and wonder. They both had fulfilling careers: he is a college professor, she is an accomplished weaver and textile artist. Their near-perfect life came to an end a year ago when they sold their home and moved into an independent living apartment for the elderly. He is only 50. She is 49. She is the reason they are now living in this situation. A series of seizures and strokes revealed brain tumors. Over time she became more absent-minded, more forgetful. Her lucid periods are fewer and fewer. After the two surgeries and a painful recovery, he and she talked about the future and what they would do with their lives — but with the new, sobering realization that they would not live forever. Her dementia is comparable to mid-stage Alzheimer’s. She rarely steps outside the surety of their apartment; he often has to remind her who he is and that they are married. “In the past we’d had fun with ideal questions about the future: If we could live anywhere in the world, where would it be? or What would we do with a million dollars? “This time it was more serious: What will we do if you don’t remember who I am? We agreed that staying together was the most important thing . . .
“Sometimes I think about the vows my wife and I made to each other, 28 years ago and then again last summer. We’re different people than we once were. Does that make the promise easier? “Last summer I said to her: You can trust me. I’ll always tell you the truth about what’s happening. Today I tell her small, comforting lies. Some promises, though, aren’t just things you say or intend to do; they’re about what kind of person you are. That makes it easier to decide what’s right . . .
Today’s Feast of the Holy Family reminds us that being a family is a journey of changes and challenges — and that it is the love of our spouses and children and brothers and sisters that enables us to negotiate and survive those changes, to confront and move on from those challenges. Our belonging to a family means that each one of us – parent and child — reflects for one another the selfless, limitless and unconditional love of Christ, both in good times and bad. The Holy Family is a model for our own families as we struggle together to adapt and change and to deal with the many tensions and crises that threaten the stability, peace and unity that are the joys of being a family. A few years ago, a study was undertaken to find the U.S. city with the lowest incidence of cancer and heart disease. The winner was Rosetto, Pennsylvania. Soon experts descended upon the city expecting to see a town populated by non-smokers, people who ate the correct food, took regular exercise and kept close track of their cholesterol. To their great surprise, however, the researchers discovered that none of the above was true. They found instead that the city’s good health was tied to the close family bonds that prevailed within the community. This suggests that there is much to be said for a close and loving family relationship. (Robert Duggan & Richard Jajac). In an audience Pope Paul VI told how one day, when he was Archbishop of Milan, he went out on parish visitation. During the course of the visitation he found an old woman living alone. ‘How are you?’ he asked her. ‘Not bad,’ she answered. ‘I have enough food, and I’m not suffering from the cold.’ ‘You must be reasonably happy then?’ he said. ‘No, I’m not’, she said as she started to cry. ‘You see, my son and daughter-in-law never come to see me. I’m dying of loneliness.’ Afterwards he was haunted by the phrase ‘I’m dying of loneliness’. And the Pope concluded: ‘Food and warmth are not enough in themselves. People need something more. They need our presence, our time, our love. They need to be touched, to be reassured that they are not forgotten’ (Flor McCarthy in New Sunday and Holy Day Liturgies). A little boy greets his father as he returns from work with a question: “Daddy, how much do you make an hour?” The father is surprised and says, “Look, son, not even your mother knows. Don’t bother me now, I’m tired.” “But Daddy, just tell me please! How much do you make an hour?” the boy insists. The father finally gives up and replies, “Twenty dollars.” “Okay, Daddy,” the boy continues, “Could you loan me ten dollars?” The father yells at him, “So that was the reason you asked how much I earn, right? Now, go to sleep and don’t bother me anymore!” At night the father thinks over what he said and starts feeling guilty. Maybe his son needed to buy something. Finally, he goes to his son's room. “Are you asleep, son?” asks the father. “No, Daddy. Why?” replies the boy. “Here's the money you asked for earlier,” the father said. “Thanks, Daddy!” replies the boy and receives the money. The he reaches under his pillow and brings out some more money. “Now I have enough! Now I have twenty dollars!” says the boy to his father, “Daddy, could you sell me one hour of your time?” Today’s readings have a message for this man and for all of us, and the message is that we need to invest more of our time in our family life. 6: Making the family a confessional rather than a court room. A senior Judge of the Supreme Court once congratulated the bride and groom in a marriage with a pertinent piece of advice: “See that you never convert your family into a court room; instead let it be a confessional. If the husband and wife start arguing like attorneys, in an attempt to justify their behavior, their family becomes a court of law and nobody wins. On the other hand, if the husband and the wife -- as in a confessional -- are ready to admit their faults and try to correct them, the family becomes a heavenly one.” Thus we can avoid the dangers we watch in dysfunctional families as presented in TV in the shows like Married with Children, The Simpson’s, Everyone Loves Raymond and Malcolm in the Middle. The homeless man or woman today in the streets of big cities, fighting the cold and the snow, is part of our family. The drug addict in a den, or living in fear and aloneness this day, is a member of our family. The sick person, dying, alone, dirty and maybe even obnoxious, is a member of our family. The person sitting in the prison cell for whatever reason is also a child of God, and as such, according to St. John, is a member of our family. All these, as well as the cherished intimate members of our family, are “family valuables,” and, as such, are worthy of safekeeping and reverence. Let us pray for the grace of caring for one another in our own families, for each member of the parish family, and for all families of the universal Church. 8: Every Holy Mass in which we participate is our feast of presentation. Although we were officially presented to God on the day of our baptism we are presenting ourselves and our dear ones on the altar before God our Father through our Savior Jesus Christ at every Holy Mass. Hence we need to live our daily lives with the double awareness that we are dedicated people consecrated to God and that we are obliged to lead holy lives. 1: Long Training: A mother goes to her pastor and explains that her son seems very interested in becoming a priest. She would like to know what this would require. So the priest begins to explain: "If he wants to become a diocesan priest, he'll have to study for eight years. If he wants to become a Franciscan, he'll have to study for ten years. If he wants to become a Jesuit, he'll have to study for fourteen years." [This joke originated back when young men entered seminaries right after high school.] The mother listens carefully, and as the priest concludes, her eyes brighten. "Sign him up for that last one, Father -- he's a little slow!" The second reading from Paul’s letter to the Colossians describes the cordial atmosphere that should reign in a Christian community, and in a Christian family. Fraternal love has to be the hallmark of the Christian community and every family is a small Christian community where love must prevail. In order that love might prevail in a Christian community and family every member has to do his or her bit; it is not the task only of the parents or the onus of the children alone to contribute to the family spirit. A harmonious atmosphere in the family can be maintained by the practice of the virtues of kindness, gentleness, mutual respect, patience and above all forgiveness. 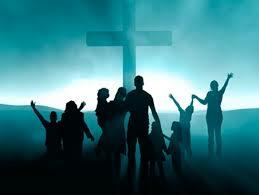 Parents should set an example for their children by the way they live their Christian lives. A military commander’s three-year-old daughter was a bundle of joy and energy. The commander was noted for strict discipline. One day, annoyed with the child’s antics, the mother commented to father: “What is the use of your being a disciplinarian. Look at your daughter, so naughty and mischievous. Why don’t you bring a little discipline in her? The commander took this seriously. He called his daughter and said to her, “Today onwards you should be well disciplined.” She said, “OK Daddy!” “Don’t call me Daddy. Whenever you want to talk to me you should start with Sir and end with Sir”, said he. The girl immediately responded, “Sir, yes, Sir.” Even if she wanted to have ice cream she had to “Sir, I want ice cream Sir.” One day the commander went shopping and the little girl wanted to go along. He agreed to take her provided she sat in the back seat of the car. She agreed and about half the way to their destination he felt a little hand on the back of his neck and heard her….. “Sir, I love you Sir.” The commander got the message. In today’s reading of Matthew’s Gospel, we are told how God watches over the family of Jesus Mary and Joseph, guiding, guarding and protecting them from all harm. What he does for the family of Nazareth, he does for every family, for He is the giver and protector of all life. 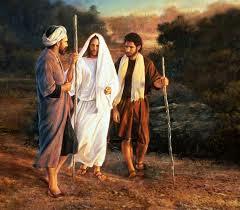 His care is seen in the wondrous way he inspires Joseph to rise and flee from the clutches of Herod. Joseph on his part implicitly trusts the divine inspiration he receives without questioning or trying to understand God’s plan. He is unmindful of the hardships he and his family have to endure. He is faithful to his task of guarding and nurturing the divine life entrusted to him. After he has settled down in Egypt and the child is growing up, once again he is told to move and return to his former home in Nazareth. Joseph and Mary silently obey God’s plan. In the gospel we see exemplified the primary obligation of parents, which is to love, care and protect their children. 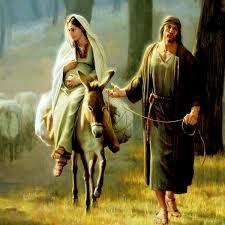 We see what Mary and Joseph did in order to ensure the safety of the child Jesus. As soon as they learned that his life was in danger, they uprooted themselves and went into exile. And when the danger had passed years later, they uprooted themselves again and returned to their native country. Many parents are called to make enormous sacrifices for their children. All parents can draw inspiration from the example of Mary and Joseph. It was a busy day in Costa Mesa, a Californian home. But then, with ten children and one on the way, every day was a bit hectic for Davida Dalton. On this particular day, however, she was having trouble doing even the routine chores-all because of one little boy. Len, who was three at that time, was on her heels no matter where she went. Whenever she stopped to do something and turned back around, she would trip over him. Several times, she patiently suggested fun activities to keep him occupied “Wouldn’t you like to play on the swing set?” she asked him. But he simply smiled an innocent smile and said, “Oh, that’s all right, Mommy. I’d rather be in here with you.” Then he continued to bounce happily along behind her. After stepping on his toes for the fifth time, she began to lose her patience and insisted that he go outside and play with the other children. When she angrily asked him why he was acting this way, he looked up at her with sweet green eyes and said, “Well, Mummy in the school my teacher told me to walk in Jesus’ footsteps. But I can’t see him, so I’m walking in yours.” She gathered him in her arms and held him close. Tears of love and humility spilled over from the prayer that grew in her heart prayer of thanks for the simple, yet beautiful perspective of a three-year-old boy. The movie Shane starring Alan Ladd has become a frontier classic. Shane is a mythical American hero who fights for the rights of defenseless homesteaders being terrorized by a lawless cattleman and his hired gunmen. Shane himself is an ex-gunslinger who is searching for something to give meaning to his life. At first he merely befriends the Start family, who take him in as a hired hand for their farm. But when trouble begins, Shane becomes their defender and savior. He risks his life for Joe and Marion Start and their son Li’l Joe in order to save their pride and property from the ruthless cattleman. The movie Shane is more than a cowboy legend. 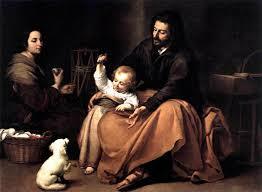 It is also a modern parable about a Christ-figure and about family life. Shane is a Christ-figure in the story, not in the sense of his use of guns and fistfights, but in the sense of a celibate man who defends the powerless, risks his life for them, and then rides off alone to help someone else. As a student, Daniel Webster (author of Webster’s Dictionary) was particularly marked for being untidy. Finally the teacher, in exasperation, told him that if he appeared again with such dirty hands she would thrash him. He did appear in the same condition. “Daniel”, she said, “hold out your hand.” Daniel spat on his palm, with an intention to clean it, rubbed it on his trousers and held it out. The teacher surveyed it in disgust. “Daniel”, she said, “if you can find me another hand in this school that is dirtier than that, I will let you off.” Daniel promptly held out his other hand! –Many children with an eccentric trait blossom into geniuses. The teachers and parents should not underestimate them or humiliate them. In the Eye of the Storm by Max Lucado Word Publishing, 1991, pp. 97-98. Even that first famous Adams generation (children of 2nd president John Adams, 1735-1826) had more than its share of black sheep. John and Abigail's eldest child, Abigail, married a wastrel and at her death left her children to their care. Son Charles married the sister of his spendthrift brother-in-law, dissipated family funds, died of alcoholism and left his widow to the care of his parents. Son Thomas Boylston also became an alcoholic, again bequeathing his children to the care of the family. Though John Quincy (1767-1848) turned out well, he and his unhappy wife Louisa hardly went unscathed. Thier first son was an alcoholic and committed suicide at the age of 31. Their next son was expelled from college, failed in business and died of an alcohol-related illness. Only their youngest son, Charles Francis (1807-86), reacted against the family pattern by his exemplary sobriety, his prudence in business and fervent dedication to his wife and children. He spent years writing the biography and editing the words of his grandfather John Adams. But he concluded, "The history of my family is not a pleasant one to remember. It is one of great triumphs in the world but of deep groans within, one of extraordinary brilliancy and deep corroding mortification." It started with Rent-A-Wife, a small Petaluma, California, company created by Karen Donovan to help clients decorate their homes, balance checkbooks, run errands, etc. Donovan, who launched her business through a small ad in the local newspaper, is already thinking big after four months of operation. She wants to hire her father to initiate Rent-A-Husband and her two teens to start Rent-A-Family. "We can do what any family does," the newfangled entrepreneur joked. "We can come over and eat all the food, turn on all the lights, put handprints on the walls, take showers and leave the towels on the floor. When clients are finished with Rent-A-Family, they'll have to call Rent-A-Wife. In 1978, Thomas Hansen of Boulder Colorado, sued his parents for $350,000 on grounds of "malpractice of parenting." Mom and Dad had botched his upbringing so badly, he charged in his suit, that he would need years of costly psychiatric treatment. *Communicating and listening *Affirming and supporting family members *Respecting one another *Developing a sense of trust *Sharing time and responsibility *Knowing right from wrong *Having rituals and traditions *Sharing a religious core *Respecting privacy. Focus on the Family Bulletin, December, 1988 . Appreciation. "Family members gave one another compliments and sincere demonstrations of approval. They tried to make the others feel appreciated and good about themselves." Ability to Deal with Crises in a Positive Manner. "They were willing to take a bad situation, see something positive in it and focus on that." Time Together. "In all areas of their lives--meals, work, recreation--they structured their schedules to spend time together." High Degree of Commitment. "Families promoted each person's happiness and welfare, invested time and energy in each other and made family their number one priority." Good Communication Patterns. "These families spent time talking with each other. They also listened well, which shows respect." Human Development and Family Department at the University of Nebraska- Lincoln. Families in 2000 will average 1.81 children, down from 1.84 today. Some 60 percent of kids born in the '80s will live for a time with one parent; 1 kid in 4 will live with a stepparent by age 16. One third of all households will be childless. . . Supporting a teenager still at home will cost $12,000 a year against $7,000 now. Kids who head to college in 2000 will need upwards of $100,000 for each bachelor's degree. U.S. News and World Report, Dec 25, 1989. Rudyard Kipling once wrote about families, "all of us are we--and everyone else is they." A family shares things like dreams, hopes, possessions, memories, smiles, frowns, and gladness...A family is a clan held together with the glue of love and the cement of mutual respect. A family is shelter from the storm, a friendly port when the waves of life become too wild. No person is ever alone who is a member of a family. Parents rate their inability to spend enough time with their children as the greatest threat to the family. In a survey conducted for the Massachusetts Mutual Life Insurance Corp., 35 percent pointed to time constraints as the most important reason for the decline in family values. Another 22 percent mentioned a lack of parental discipline. While 63 percent listed family as their greatest source of pleasure, only 44 percent described the quality of family life in America as good or excellent. And only 34 percent expected it to be good or excellent by 1999. Despite their expressed desire for more family time, two-thirds of those surveyed say they would probably accept a job that required more time away from home if it offered higher income or greater prestige. Moody Monthly, December, 1989, p. 72. Becoming good at the things that build inner confidence and calm takes practice -- and a dash of creativity! The following list might provide some cloudseeding for a brainstorm or two of your own. Have some fun with your family...and get ready for a good rest. 1. Pay off your credit cards. 2. Take off ten pounds or accept where you are without any more complaints. 3. Eat dinner together as a family for seven days in a row. 4. Take your wife on a dialogue date (no movie, guys). 5. Read your kids a classic book (Twain's a good start). 6. Memorize the Twenty-third Psalm as a family. 7. Give each family member a hug for twenty-one days in a row (that's how long the experts say it takes to develop a habit). 8. Pick a night of the week in which the television will remain unplugged. 9. Go out for a non-fast food dinner as a family. 10. Pray for your spouse and children every day. 11. Plan a vacation together. 12. Take a vacation together. 13. Read a chapter from the Bible every day until it becomes a habit. 14. Sit together as a family in church. 15. Surprise your teenage. Wash his car and fill up his gas tank. 16. Take an afternoon off from work; surprise your child by excusing him from school and taking him to a ball game. 17. Take a few hours one afternoon and go to the library as a family. 18. Take a walk as a family. 19. Write each member of your family a letter sharing why you value them. 20. Give your spouse a weekend getaway with a friend (same gender!) to a place of their choice. 21. Go camping as a family. 22. Go to bed early (one hour before your normal bedtime) every day for a week. 23. Take each of your children out to breakfast (individually) at least once a month for a year. 24. Turn down a promotion that would demand more time from your family than you can afford to give. 25. Religiously wear your seat belts. 26. Get a complete physical. 27. Exercise a little every day for a month. 28. Make sure you have adequate life insurance on both you and your spouse. 29. Write out information about finances, wills, and important business information that your spouse can use to keep things under control in the event of your death. 30. Make sure your family car is safe (tires, brakes, etc.) and get it tuned up. 31. Replace the batteries in your smoke alarm. 32. Put a security system in your house. 33. Attend the parent/teacher meetings of each child as a couple. 34. Help your kids with their homework. 35. Watch the kids on Saturday while your wife goes shopping (but if a friend calls, don't say that you're "babysitting"). 36. Explain to your spouse exactly what you do for a living. 38. Take time during the week to read a Bible story to your children and then discuss it with them. 39. Encourage each child to submit to you his most perplexing question, and promise him that you'll either answer it or discuss it with him. 40. Finish fixing something around the house. 41. Tell your kids how you and your spouse met. 42. Tell your kids about your first date. 44. Go on a shopping spree where you are absolutely committed to buying nothing. 45. Keep a prayer journal for a month. Keep track of the specific ways that God answers your needs. 46. Do some stargazing away from the city with your family. Help your children identify constellations and conclude the evening with prayer to the majestic God who created the heavens. 47. Treat your wife to a beauty make-over (facial, manicure, haircut, etc.). I hear they really like this. 48. Give the kids an alternative to watching Saturday morning cartoons (breakfast at McDonald's, garage sales, the park, chores, etc.). 49. Ask your children each day what they did at school (what they learned, who they ate lunch with, etc.). 50. After you make your next major family decision, take your child back through the process and teach him how you arrived at your decision. 51. Start saying to yourself "My car doesn't look so bad." 52. Call you wife or husband from work just to see how they're doing. 53. Compile a family tree and teach your children the history of their ancestors. 54. Walk through an old graveyard with your children. 55. Say no to at least one thing a day -- even if it's only a second piece of pie. 56. Write that letter to the network that broadcast the show you felt was inappropriate for prime-time viewing. 57. Turn off the lights and listen to a "praise" tape as you focus your thoughts on the Lord. 58. Write a note to your pastor praising him for something. 59. Take back all the books in your library that actually belong in someone else's library. 60. Give irritating drivers the right to pull in front of you without signaling and yelling at them. 61. Make every effort to not let the sun go down on your anger. 62. Accept legitimate criticism from your wife or a friend without reacting or defending yourself. 63. If your car has a Christian bumper sticker on in -- drive like it. 64. Do a Bible study on the "wise man" and the "fool" in Proverbs...and then apply what it takes to be wise to your life. 65. Make a list of people who have hurt your feelings over the past year...then check your list to see if you've forgiven them. 66. Make a decision to honor your parents, even if they made a career out of dishonoring you. 67. Take your children to the dentist and doctor for your wife. 68. Play charades with your family, but limit subjects to memories of the past. 69. Do the dishes for your wife. 70. Schedule yourself a free day to stay home with your family. 71. Get involved in a family project that serves or helps someone less fortunate. 72. As a family, get involved in a recreational activity. 73. Send your wife flowers. 74. Spend an evening going through old pictures from family vacations. 75. Take a weekend once a year for you and your spouse to get away and renew your friendship. 76. Praise your spouse and children -- in their presence -- to someone else. 77. Discuss a world or national problem, and ask your children for their opinion on it. 78. Wait up for your teenagers when they are out on dates. 79. Have a "quiet Saturday" (no television, no radio, no stereo...no kidding). 80. If your children are little, spend an hour playing with them -- but let them determine the game. 81. Have your parents tell your children about life when they were young. 82. Give up soap operas. 84. If you have a habit of watching late night television, but have to be to work early every morning, change your habit. 85. Don't accept unnecessary breakfast appointments. 87. Go through your closets and give everything that you haven't worn in a year to a clothing relief organization. 88. Become a faithful and frequent visitor of your church's library. 89. Become a monthly supporter of a Third World child. 90. Keep mementos, school projects, awards, etc. of each child in separate files. You'll appreciate these when they've left the nest. 91. Read the biography of a missionary. 92. Give regularly and faithfully to conscientious church endeavors. 93. Place with your will a letter to each family member telling why you were glad you got to share life with him or her. 94. Go through your old records and tapes and discard any of them that might be a bad testimony to your children. 95. Furnish a room (or a corner of a room) with comfortable chairs and declare it the "disagreement corner." When conflicts arise, go to this corner and don't leave until it's resolved. 96. Give each child the freedom to pick his favorite dinner menu at least once a week. 97. Go over to a shut-in's house as a family and completely clean it and get the lawn work done. 98. Call an old friend from your past, just to see how he or she is getting along. 99. Get a good friend to hold you accountable for a specific important need (Bible reading, prayer, spending time with your family, losing a few pounds, etc.). 101. Go to a Christian marriage enrichment seminar. Tim Kimmel, Little House on the Freeway, pp. 219-223. Rose Sands, The Saturday Evening Post. Who can ever forget Winston Churchill's immortal words: "We shall fight on the beaches, we shall fight on the landing grounds, we shall fight in the fields and in the streets, we shall fight in the hills." It sounds exactly like our family vacation. An exhaustive study shows that no woman has ever shot her husband while he was doing the dishes. James Dent, Charleston, W.Va., Gazette. The man who seldom finds himself in hot water is the one with a wife, several daughters and one bathroom.